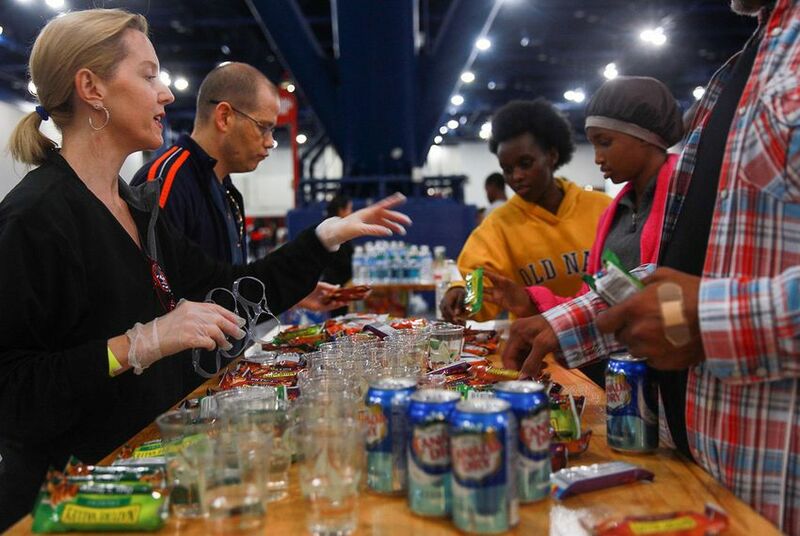 The director of the federal Hurricane Harvey relief efforts offered guidance to Texans affected by the storm and urged citizens to help. Editor's note: This story has been updated to note that President Donald Trump is scheduled to arrive in Corpus Christi on Tuesday. WASHINGTON — Officials leading the federal Hurricane Harvey relief operation emphatically called on all Americans to support rescue efforts in Southeast Texas. "Helping Texas overcome this disaster is going to be far greater than FEMA coordinating the mission of the entire federal government," Federal Emergency Management Agency Director Brock Long said at a Monday morning news conference. "We need citizens to be involved. This is a landmark event. We have not seen an event like this. You could not ... dream this forecast up." Long said he planned to travel to Corpus Christi and San Antonio on Monday morning to be with Gov. Greg Abbott. Long refused to criticize the decision of Houston-area leaders to direct constituents to stay put, rather than evacuate. "I believe that every local official, state official and including us, are operating with the best information we've been provided at the time," Long said. "We will strive to get better, but right now, guys, it's not a time to start pointing blame," he added. A federal official at the news conference said that President Donald Trump still planned to visit the state on Tuesday. Abbott told CBS This Morning that Trump will avoid Houston to stay out of the way of recovery efforts. The White House Press Office announced Monday morning that Trump will arrive in Corpus Christi at 11 a.m. Central time. People in the flooded regions should not get into their cars. That could put their lives at risk and drain resources that could be used to rescue citizens elsewhere. Those wanting to support relief efforts should visit the website National Voluntary Organization Active in Disaster. For those who need assistance, visit www.disasterassistance.gov. If a person does not have internet access, call 1-800-621-FEMA. The U.S. Army Corps of Engineers was working to restore electrical power to "critical infrastructure." National Flood Insurance Program policy holders should "call your insurance agent. Go ahead and start that ball rolling." Long called on Congress to reauthorize the federal flood insurance program but also suggested this was an opportunity for major reforms. But overall, his refrain on Monday morning was that while the government is coordinated in its response, this hurricane is a stunning natural disaster and has exceeded the federal government's capacity to help every Texan in need. "We need the whole community, not only the federal government forces, but this is a whole community effort from all levels of government, and it's going to require all citizens to get involved," he said. "I'm asking for all citizens to get involved, here," he added. "Donate your money, figure out how you can get involved as we help Texas find a new normal going forward after this devastating disaster." Long maintained the refrain from most federal officials working on the effort: Federal agencies are taking cues from local officials and aim to back up each rung of government as resources are expended. "They set the mission priorities right now; we fall in line to support those," he added.